that they be found faithful. In creation, there is nothing more valuable than human life. And this is doubly true for those who have been purchased with the infinite blood of Christ (Acts 20:28; 1 Corinthians 6:19; 1 Peter 1:18–19). God sent his Son to Calvary to redeem a people for his own possession, and so great is his love for his people that the Good Shepherd has raised up shepherds who would tend his flock. Sometimes these spiritual leaders are called pastors, or overseers, or elders—synonymous terms for the same office. At the same time, while each of these labels stress different aspects of local church ministry, there is another title that needs consideration—steward. In Paul’s letters especially, “steward” (oikonomos) describes the kind of ministry pastors are to have. As Christ gives pastors to his people (Ephesians 4:11), he gives them to particular, groups of people—i.e., local churches. In Acts 2, when the church was “birthed,” new converts were “added to the number” of the church (v. 47; cf. 4:5, 32; etc.). Later Paul could speak of a “majority” in the church (2 Cor 2:6) or the “whole church” gathering, indicating an awareness of the number of the people. The importance of this observation is that God has not simply given pastors to be spiritual mentors or life coaches to Christians in general. He has called them to manage local gatherings of God’s household. For good reason, most pastoral literature focuses attention on the multivalent duties of the pastor/overseer/elder. However, focus on these three labels without consideration of the fourth gives us an incomplete picture. There needs to be equal emphasis given to the idea of the pastor as God’s steward. In fact, such a notion focuses the high calling of a pastor within the parameters of a local church and clarifies the importance for Christians to be members of a local church. Without disregarding the vital importance of the universal church, the pastor as steward corrects amorphous understandings of spiritual leadership and church life. In the New Testament, oikonomos and oikonomia are two words related to the oversight of a house. The oikonomos functioned as a household manager, a steward who oversaw the affairs of an estate. For instance, in Luke’s Gospel Jesus twice uses the term in two different parables (Luke 12:42; 16:1, 3, 8) to speak of a household “manager.” Likewise, Erastus a public official in Corinth is called an oikonomia in Romans 16:23. And Paul uses the word in Galatians 4:2 to describe the “manager” who oversees a son “until the day set by his father.” Like Joseph in Potiphar’s house (Genesis 39), therefore, the steward was placed “over” his master’s wealth (cf. 1 Kgs 4:6; 16:9; 18:3; 2 Kings 18:18, 37) and entrusted to produce an increase (as in the parable of the talents, Matthew 25:14ff). Sometimes this wealth was material, other times (as in Galatians 4:2) it was familial. These “secular” uses of the word improve our understanding of what Paul means by the term. When he describes himself (and his co-laborers) as stewards he sees himself as stewarding the riches of God, which are found in the household of God. More precisely, he sees himself fulfilling his Lord’s wishes by bringing the riches of the gospel (1 Corinthians 4:2) to the children of the household. In sum, he envisions pastors stewarding the gospel and God’s people. In the world, there is nothing more precious than these two realities—the Word of God and the people of God. And not surprisingly, the place where both dwell is “the household of God” (1 Timothy 3:15). In the Old Testament, the Decalogue rested in holy of holies, the place where the priest (frightfully) communed with the Lord. Now under a new dispensation, the people of God have been made God’s dwelling place, his temple (1 Corinthians 3:16–17). The Spirit seals them (Ephesians 1:13–14) and fills them (Ephesians 5:18), just as the word of God dwells richly within them (Colossians 3:16). The role of the steward, therefore, is to bring the people to the Word and the Word to the people, which is exactly what we find described in the Bible. First, God’s stewards are entrusted with God’s Word. Paul marveled at the treasure he was given in the gospel of God. He often spoke of the gospel in terms of riches (“the unsearchable riches of Christ,” Ephesians 3:8; cf. Romans 2:4; 9:23; 10:13; 11:12; 2 Corinthians 6:10; 8:9; Ephesians 1:18; 2:7). He saw ministry as building the household of God with precious metals (“gold, silver, and precious stones,” 1 Corinthians 3:12). Indeed, the gospel is a treasure, and the servant of the Word must therefore handle it accordingly. We do not peddle God’s Word (2 Corinthians 3:17); rather, we rightly divide it as faithful stewards (2 Timothy 2:15). For this reason, Paul calls elder candidates to be “stewards” who “hold firm to the trustworthy word as taught, so that he may be able to give instruction in sound doctrine and also to rebuke those who contradict it” (Titus 1:7, 9). Likewise, in every instance where Paul speaks of “stewardship” (e.g., 1 Corinthians 4:1–2; 9:16–18; Ephesians 3:1–3; Colossians 1:25; 1 Timothy 3:4), proclamation of the gospel and the explication of God’s Word is in view. Therefore, stewards are entrusted with God’s greatest treasure, the Word of God, and must handle it faithfully. Second, God’s stewards are entrusted with God’s people. Putting all this together, the flow of argument in Ephesians 1–3 situates Paul’s ministry (his stewardship) in the larger development of redemptive history. As Ephesians 2 explains, whereas the old covenant divided humanity into Jew and Gentile, the gospel which has been revealed in Christ has torn down the dividing wall and made from them both “one new man” (vv. 14–16). As Paul will explain in greater detail elsewhere (Romans 9–11), Paul’s ministry to the Gentiles fulfills God’s promises to the Jews and even works (Paul hopes) to make the Jews jealous of the Gentiles who have come to receive the rich blessings of God in Christ. Long story short, Paul’s stewardship of grace is a means to God’s greater stewardship of building from the rubble of humanity a new temple, founded on the apostles and prophets (Ephesians 2:19), built by the ongoing preaching of the cross of Christ (Ephesians 2:17; 3:1–9). In this administration of God’s plan, the church becomes the household of God, where the people made alive by the grace of God dwell until Christ come again. This is to prove the wisdom of God and display his power through the weakness of human preaching—the stewardship Paul and all pastors have. Running this forward unto today, God’s stewards have not only the responsibility to care for God’s Word, they must also manage, oversee, steward God’s flock. 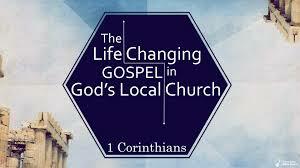 It is the local church which serves as God’s heavenly embassy; Paul’s introduction to the Corinthians, “to the church of God that was in Corinth” (1:2) tells us how the local church manifests realities greater than itself. Within such churches, God places gifted teachers (Ephesians 4:11) to build up the saints for the work of service (4:12). Together, each local body is knit together and nourished by all its living parts. The end goal is a people who “build [themselves] up in love” (4:16). This displays the power of the gospel, and each church requires faithful stewards who defend and declare the Word of God (cf. Acts 14:23). In sum, we can connect these two aspects of stewardship together. Faithful stewards bring the Word of God to the people of God. Faithful stewards shepherd the people of God with the Word and prayer. Applied by pastors today, we must stress the primacy of ministry in the local church. While there are places of ministry outside and beyond the church, faithful pastors devote themselves to the church God has called them to steward. It is the local church where pastors must give their attention and energy. Even as external opportunities for ministry arise, the faithful pastor must always ask, “How does this ministry benefit my local church?” Or, “How does my church stand with me or send me in this ministry venture?” While platforms for preaching and teaching the gospel far exceed the local church, a steward of God’s Word will always be looking to invest his life in his local church. At the same time, this notion of stewardship invests the church with infinite value. As Paul said to the elders of Ephesus, “the Holy Spirit has made you overseers, to care for the church of God, which he obtained with his own blood” (Acts 20:28). His words reinforce the pastor-congregation relationship, but it also esteems the value of God’s church. No matter the size, location, demographic, education-level, or socio-economic caste, the true church is a heavenly people, an embassy of God’s kingdom, an infinitely valuable possession to God. This has two effects: (1) it informs the congregation of who they are and what God thinks of them and (2) it motivates the energetic pastor to invest his life in God’s people. In sum, these two realities are meant to build up local churches. First, individuals should be motivated to join local churches because they are the ones promised to receive Christ’s pastors who will teach them and watch over them as the very prize of God. It is true that Christians in West can find books and sermons to inform them of biblical truth, but there is nothing outside the local church which can replace the principle of “stewardship” outlined in the New Testament. At the same time, the principle of stewardship tethers pastors to their local churches. In this, it protects them from the siren songs of Christian celebrity and it reminds them of their true calling. We will give an account for the sheep entrusted to us and for how well we fed and led them with the word of God. This is the pastor’s stewardship. May God be pleased to help us fulfill this calling. And may we never despise the labor bringing gospel riches to God’s people. Blaising and Bock, Progressive Dispensationalism, 107: “The management activity of an oikonomos usually involved financial transactions requiring a careful accounting of funds received and disbursed. This reference to money and finance carries over into our English word economy which translates the Greek oikonomia. The words steward and stewardship, which also translates oikonomos and oikonomia, carry this notion of financial responsibility while extending the sense of accountability to non-financial matters, as well. The KJV and NKJV follow the Textus Receptus which does not have oikonomia in 3:9, but koinonia. Therefore, they translate the word “administration” in 1:10 and “fellowship” in 3:10.